Each generation takes some aspects of Bach performance as a stick with which to beat the previous, and as time flows the challenge becomes the new orthodoxy. There are few artists who really go back to basics and question every aspect of performance, taking everything back to what we know of Bach's own performances. Instead, there are certain ways of doing things which can become the norm, despite having little historical accuracy. For the performance of Bach's St John Passion at Temple Church on Tuesday 11 April 2017 (as part of Temple Music's season), conductor Greg Morris used the combined forces of the Bar Choral Society (numbering some 50 singers) and Collegium Musicum London Chamber Choir (numbering some 30 singers) to evoke the singing of the chorales in Bach's day. Whatever happened in the rest of the passion, for Bach and his congregations, the chorales were a large scale participatory experiences - everyone sang, with Bach accompanying on the organ. And hearing the Temple Church filled with the expressive sound of 80 voices and the church organ, played by Daniel Moult, (plus the 10 instrumentalists in the Temple Players, leader Theresa Caudle, gamely contributing) was a stirring and moving experience. Central to the performance was the Evangelist of James Way, and the Christus of Gareth Brynmor John. Elsewhere the performance stuck to more modern orthodoxies. There four soloists (Augusta Hebbert, Tim Travers-Brown, Matthew Sandy, Andrew Rupp) singing just the arias which gave Hebbert in particular rather little to do, the church organ was not used for the continuo, which was provided by Thomas Foster on a portative organ, and the choruses were sung by Collegium Musicum London. Bach did not perform the passion like this (he probably had no more than eight singers in total, with soloists coming from the vocal ensemble and the church organ was used throughout). But the St John Passion is certainly strong enough to take a variety of performance styles and we should consider each performance on its own terms. At the Temple Church, the balance of chorus and orchestra was not ideal, and though the Temple Players made a strong and vibrant noise considering there were only five string players, the sound of the amateur choir could have done with a firmer, richer instrumental foundation. The choir made a finely vigorous contribution to the piece, bringing out the dramatic emotions but Greg Morris's speeds seemed not to take into account the exigencies of performing with amateur singers, parts of the opening chorus started to run away somewhat, and in the turbae, detail became smudged as Morris prized impulse and dramatic vigour. Though all four soloists sang creditably in the arias, they showed varying degrees of skill in seizing the moment and making the most of the opportunities Bach did give them. Augusta Hebbert sang with light, bright tone and a lovely inner strength, expressively shaping the music and making a conscious effort to really communicate with the audience. Tim Travers-Brown has a very traditional English counter-tenor voice, with a nice narrow-focus tone though the top of his register was not as relaxed as it could be. He sang both his solos with a plangent edge, creating a relaxed yet meaningful sense of the piece, and 'Es ist vollbracht' was performed with fine sense of inner calm. But I sometimes wanted a little more sense of him performing to us. Tenor Matthew Sandy seemed to be in some vocal difficulties, his voice not always operating correctly. He certainly conveyed the real dramatic intensity of the tenor arias, but there were moments when you wanted a little more relaxed tone. Bass Andrew Rupp was finely correct, contributing some beautiful, technically strong singing, but I wanted him to sing more to us and less to his copy. In the bass aria with chorus ('Eilt, ihr angefochtnen Seelen'), Greg Morris did revert to another of Bach's practices, having the chorus part sung by the soloists thus giving a greater degree of focused accuracy. What really lifted the performance was the contribution of the two young soloists as Evangelist and Christus. 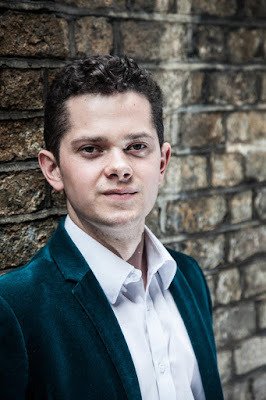 Tenor James Way is still studying at the Guildhall School of Music and Drama, but his performance as Evangelist gave no sense of still being in the process of study. It was a confident and finely dramatic account, full of subtlety and rich drama. Way has a bright toned lyric tenor with an interesting depth to the tone, and he showed a lovely freedom in the high-lying line. The Evangelist is a big sing, and Way's pacing was impressive so the end had all the virtues of the beginning. His projection of the words was strong, and he brought out the nuances of individual moments. Clearly Way will develop as an artist, but his Evangelist is already very impressive and finely moving. Way was superbly partnered by Gareth Bynmor John's Christus, John brought a firm-toned authority to the role, singing with commitment and dramatic credibility. He really made Christus a dramatic character rather than simply symbol, and the long scene before Pilate (with Andrew Rupp singing Pilate) saw Way, John and Rupp bringing out the sustained, almost operatic drama which Bach invests in the piece. The smaller solos were sung by Augusta Hebbert and Matthew Sandy, with a bass from Collegium Musicum singing Peter. The Temple Players provided strong and expressive instrumental support, playing with vigour for the choruses and giving some beautifully subtle playing in the arias with plenty of lovely solo moments. Violinist Emilia Benjamin also contributed a poised viola da gamba solo in the alto aria 'Es is vollbracht'. The combination of James Way's Evangelist and Gareth Brynmor John's Christus with the feeling of the choruses filling the church with the chorales brought out the sense of Bach's commitment to The Word. And though not every detail of the performance was as satisfactory, overall Greg Morris and his performers gave us a finely satisfying account.